This eight-sided red sign means STOP. You must make a complete stop at the stop line every time you approach a stop sign. If there is no stop line, stop before entering the crosswalk. If there is no crosswalk, stop before entering the intersection. Always yield the right-of-way to pedestrians and approaching traffic. If it is an all-way STOP sign, wait your turn. 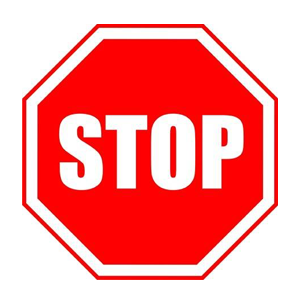 If the STOP sign is hand-held, stop until an authorized person, such as a school guard or construction zone flagger, signals that it is safe to proceed. 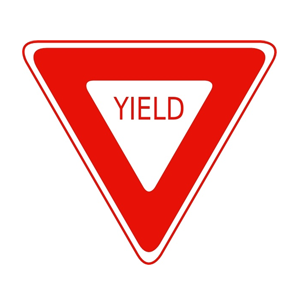 When approaching a yield sign you should slow down to a safe speed and stop if necessary. When stopping, do so at a marked crosswalk or before entering the intersection. You also may see ‘YIELD’ signs on expressway ramps. These type of signs are posted when there is no extra lane for drivers to speed up to or merge with into expressway traffic. Posted regulatory signs (i.e., speed limits) are black and white and tell you what you can and can’t do on the road. Some signs show maximum and minimum speed limits for all types of vehicles on freeways and limited access highways. 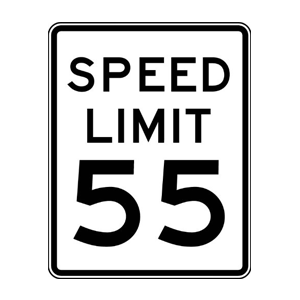 In construction and maintenance zones, posted speeds legally reduce the speed limit on that portion of the highway. Unless necessary for safety, driving slower than the minimum posted speed limit hazardous and illegal. Even if you legally have the right of way, be ready to yield to others who are driving aggressively. Even if you have the right of way, continue scanning even at controlled intersections. contact. Be ready to slow or stop. This entry was posted in Top Driver Blog and tagged Driver Safety, Driving Practice, New Driver, Road Safety, traffic signs.